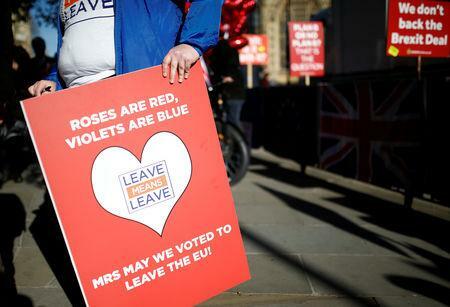 LONDON (Reuters) - Prime Minister Theresa May suffered a defeat on her Brexit strategy on Thursday that undermined her pledge to European Union leaders to get her divorce deal approved if they grant her concessions. In a show of muscle, hardline Brexit supporters in her Conservative Party decided to abstain, handing her an embarrassing, albeit symbolic, defeat as she tries to renegotiate her deal with the EU. While it will not deter May from trying to secure changes on the most contentious issue of the deal - the Irish "backstop" - the vote does show that her pro-Brexit lawmakers are a major obstacle to passing any agreement. May was absent from the House of Commons for the debate and the outcome of the vote, which deepened the sense of political crisis over Britain's departure, more than two years after voters opted to leave the bloc by a margin of 52 percent to 48. The crunch vote is now expected to come on Feb. 27, when May is due to return to parliament - and lawmakers who fear leaving without a deal could try to seize control of Britain's departure from the EU. DEAL, NO DEAL, NO BREXIT? The latest twist in the two-year negotiation to leave the EU underlines the rifts in parliament over how, or even whether, Britain should leave the bloc, its biggest political and trade policy shift in more than 40 years. It increases the possibility of Britain leaving without a deal, a nightmare scenario for many businesses, but also of Brexit being delayed or potentially never happening at all. May's spokesman said she still believed parliament wanted her to keep pressing for changes to the Brexit deal: "The government will continue to pursue this with the EU to ensure we leave on time on 29th March." EU leaders, meanwhile, have repeatedly said there can be no substantive change to the legally binding withdrawal agreement containing the backstop, a guarantee that there can be no return of border controls between the British province of Northern Ireland and EU-member Ireland. With trust in the prime minister at an all-time low, one Conservative pro-Brexit lawmaker said the government could no longer ignore eurosceptics' views. "While the vote might not be of substantive importance, what it does do is to tell the government that they really can't take Brexiteers for granted," the lawmaker said on condition of anonymity. With many Conservative lawmakers abstaining, the government defeat on its motion reaffirming support for May's strategy was a heavy one, at 303 votes to 258. The pro-Brexit European Research Group (ERG), several dozen strong, had said they would defy May unless she dispelled their concern that she might after all baulk at a no-deal exit. Ministers were keen to shrug off the defeat. "The fact that ERG colleagues abstain is sending a message that they still want to find a way forward and find a solution," said Robert Buckland, the solicitor general. ERG members say ruling out a no-deal Brexit would not only weaken Britain's negotiating hand but also remove what, for many, is the desired end-point: the cleanest possible break. But some Conservative and many opposition lawmakers accuse May of "running down the clock", edging Britain closer to the exit date to try to force parliament into a choice between backing her deal or leaving without an agreement. A majority of lawmakers agree with businesses, which say that outcome would be catastrophic for the world's fifth largest economy: causing delays at ports, fracturing crucial international supply chains and hindering investment. Opposition Labour lawmaker Alison McGovern said it was time to stop the clock on Brexit. "In any normal circumstances, this would be general election territory. It is clear that the prime minister cannot easily command a majority in the House of Commons, and that is central to our system," she told Reuters.